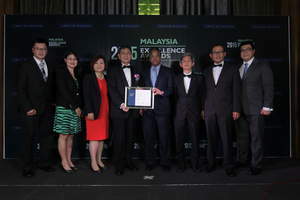 KUALA LUMPUR, MALAYSIA--(Marketwired - Apr 15, 2015) - RHB Bank Berhad was recognised as the local banking institution that provides outstanding customer experience by winning three top recognitions at the Frost & Sullivan Malaysia Excellence Awards 2015 held yesterday. RHB Bank took home three recognitions being the best in Branch Experience, Contact Centre Experience and Online Experience. Dato' Khairussaleh Ramli, Deputy Group Managing Director of RHB Banking Group and Managing Director of RHB Bank said, "We are honoured to have been recognised by Frost & Sullivan for providing outstanding customer experience in three different categories, namely Branch Experience, Contact Centre Experience and Online Experience. The trust and support shown by our customers will continue to be a driving force for all of us at the RHB Banking Group". "Delighting our customers through outstanding customer service and experience is how we want to differentiate ourselves from our competitors. We at RHB are committed to continuously enhance our customer service experience via all our customer touch points. Key to this will be innovation. Towards this end, we embarked on a comprehensive branch sales and service transformation programme a year ago. In addition, we recently launched our refreshed corporate website which provides ease of navigation and seamless access to information on products and services," added Dato' Khairussaleh. The recognitions RHB Bank received were based on the Malaysia Banking Services Customer Experience study conducted by Frost & Sullivan over a period of two months in 2014. Frost & Sullivan surveyed 1,300 respondents that were randomly selected from consumer online panels. Mr. Hazmi Yusof, Country Head and Senior Vice President, Asia Pacific at Frost & Sullivan said "Branch banking is a closely-contested category, with less than three per cent difference between the top and bottom ranked banks. This indicates that in a highly-regulated industry with limited number of service providers, there is little room for error in differentiating a bank's offerings to attract, acquire and retain customers. The Branch banking recognition is significant as it remains one of the preferred channels for customers to interact with their primary bank and carry out banking transactions." He added that RHB is also well ahead in terms of investments to improve the online touch points, with significant enhancements to the website's security features and refining the user interface to make it easy to navigate. Issued on behalf of RHB Bank Berhad by the Group Corporate Communications Division. For more information, please call Lois Kam at +603-9280 5089 or email at lois.kam@rhbgroup.com. The RHB Banking Group is the fourth largest fully integrated financial services group in Malaysia. The Group's core businesses are streamlined into three main business pillars, namely Group Retail and Commercial Banking, Group International Business and Group Corporate and Investment Banking. These businesses are offered through its main subsidiaries -- RHB Bank Berhad, RHB Investment Bank Berhad, RHB Insurance Berhad and RHB Islamic Bank Berhad, while its asset management and unit trust businesses are undertaken by RHB Asset Management Sdn. Bhd. and RHB Islamic International Asset Management Berhad. The Group's regional presence now spans ten countries including Malaysia, Singapore, Indonesia, Thailand, Brunei, Cambodia, Hong Kong, Vietnam, Lao PDR and Myanmar. It is RHB Banking Group's aspiration to continue to deliver superior customer experience and shareholder value; and to be recognised as a Leading Multinational Financial Services Group.